Yep. That song has been running…or should I say hopping around my head for the last few weeks and it may or may not come flying loudly out of my mouth just because it is so fun to annoy my family! Or, it may have something to do with getting ready to join in this fun party going on today! We were so thrilled when Judy of DIY By Design asked us to join her, along with the other lovely hostesses in doing the Bunny Blog Hop! You see, my son made one when he was in Kindergarten. And, I lovingly saved it for 3 years until that fateful day when I had a “I feel like a horrible mommy” moment. I was reorganizing the cupboard it was being stored in when it slipped from my hands (picture it all happening in slow motion while I’m yelling “nooooooo”) and fell to the ground. Of course it didn’t land right side up. Nothing like dropping a Resurrection Garden on the floor to make you feel like you need some forgiveness! Resurrection Gardens. Thank you Mrs. Hart for this wonderful idea! 4. Sticks for the cross and twine to secure them together. Using the craft glue, attach the toilet paper roll to the middle of the meat tray. Place the fabric scrap inside the “tomb”. Dab the glue all around the tray and on top of the “tomb” and then let your kids attach the moss. My kiddos loved this part! Decorate with flowers and place the cross on top. Have your child put the “stone” in front of the opening of the “tomb”. Be sure to have one of your children wear an “Angry Birds” shirt just to emphasize how holy and reverent this is! A simple and sweet little project to illustrate what we believe to be the true meaning of Easter. It’s that easy. 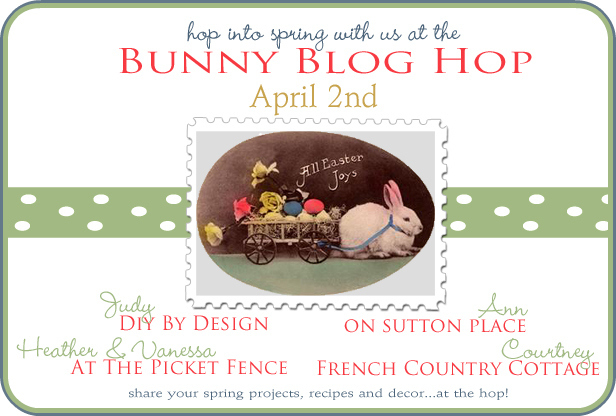 So what is a Bunny Blog Hop you ask… if you link up on my blog, your link will also appear over at DIY By Design, French Country Cottage and On Sutton Place. And when you link up, you will be entered for a chance to win this gorgeous pillow crafted by the talented and generous Ann of On Sutton Place Blog and Sutton Place Designs. 1. Just link up any Spring/Easter project, craft, decor or recipe to today’s party. Each post you link up will count as one entry (no more than four links please). 2. For a second chance to win, stop by Ann’s Etsy Shop and come back and leave a comment on what else you love in her shop. The party will remain open through Easter Sunday, April 8th, at 11:59pm. The giveaway will close on Sunday April 8th at 11:59pm EST. You must leave a separate comment for each entry in order to maximize your chances to win. Must be 18 years or older. Open only to residents in the 48 lower states. If your email address is not linked to your Google account, please make sure to include your email in your comment so you can be contacted in the case you win. If we have no way of contacting you we must pick another winner. Winners will be chosen using Random.org. We’d love you to link your post back to At The Picket Fence by using our Bunny Blog Hop Graphic (code located at the top of our sidebar) or a text link! That will help us spread the word this week about the Bunny Blog Hop! Thanks! 37 Comments on "Bunny Blog Hop~Resurrection Garden"
This was such a great idea! Thank you for hosting this Blog Hop! Your Resurrection Gardens are so beautiful…and so are your children. And I love the Angry Birds tee – heh, cute. Have a wonderful Holy Week, and a very blessed Easter to you and your family. What a wonderful craft with a lesson for kids! Thanks for hosting the blog hop! The Resurrection Gardens are so special, and a wonderful idea for children. I hope you will Come and enter my amazing Cross Bottle Guy Giveaway! They are very spiritual. How very special is the Resurrection Garden…beautiful.. Thank you all for hosting this marvelous party…and may you and your family enjoy a beautiful Easter together. Love the Resurrection Garden! Thanks for hosting, love this blog hop! What a fun idea….love the button. There are so many great ideas here. Vanessa, your kids are adorable and I love the resurrection garden craft. What a great way to teach your kids. Oh and I sure would love to win that giveaway…LOVE all of Ann’s chevron stuff! Such a great project to do with kids, Vanessa! They look so proud of theirs! I love this project. A great way to teach a child the meaning of Easter. Thanks for hosting this hoppin’ party! I love the Resurrection garden…so cute for Easter and keeping the kids involved in what it’s really about. Wowzadoodle, Vanessa! What a great par-taaay! Thank you to all the fab hostesses! What a lovely idea! A Resurrection garden–how wonderful to roll away the stone! Love this. And the picture of your kiddos is so cute, Angry Birds and all! You are such a good Mommy, Vanessa! I love their gardens … such a wonderful project to do with your sweet, precious kiddos! I love your Resurrection garden and what a wonderful project to do with your kids. I could totally feel for you when the original fell. Thanks for co-hosting today. It’s been awesome. Thanks for hosting such a fun Easter Blog Hop! Love the idea of a Resurrection Garden. Thanks so much for hosting. I’ve linked up 🙂 and can’t wait to meet some new bloggers. I love the idea of the resurrection gardens, and I have to tell you that your children are just adorable to me. (Angry birds or no angry birds. )I can relate to a special keepsake slipping from your hands, but I’ll call this one of those, “God worked it for good” moments since he not only got to make a new one along side little sister, but you got to share it with us. That is so darn cte! Not as cute as the kiddos though sorry:) No seriously that is very special and a memory they will remember for a long time to come. They looked pretty tickled with the new ones =) How nice that they made them together too! What a clever project! It makes me almost wish I taught Sunday School again! I am keeping the idea in case I ever do! such a great meaningful memory to do with your cute kids! thanks for the fun party! Your children are SO SWEET! Thank you for hosting the Bunny Blog Hop. Fun party! There are some fun projects linked up! I need to get movin’ and start crafting! Happy spring! Ann’s Garden pillows are a must!! I must have them! Thanks for hosting this fun party. I’m having so much fun visiting these posts. Have a blessed Easter! Oh I love this idea for kids! I can’t wait til my little one is big enough to do crafts like this together. I wanted to come thank you for your sweet comment at Burlap and Buttons. I’m happy to be following along with you and thanks for hosting this great Spring linky! Happy Easter! Thank you for hosting. The Resurrection Garden is so cute. I like how easy it is for kids. I LOVE your resurrection garden! What a beautiful idea. Lemon-Raspberry Coffeecake…a spring dessert for the hop! That is so sweet! What a great project – I will have to do this with my boys.